Ask any successful entrepreneur why their startup succeeded and they’ll almost always point you to a growth strategy they followed. They’ll tell you how much they believed the strategy will work because it was solid and had a really high likelihood of paying off. It’s the same with most high growth companies. They pick a solid growth strategy and follow it. Then they begin to get small wins. And they repeat the process. Before you know it, they’re all over the place. However, before you would even get the chance to use a solid strategy, your product and site has to be ready for conversions. This may come across as a no-brainer. But you’d be surprised at how many businesses fail only because their product wasn’t in demand, or lose revenue because their site just wasn’t ready for conversions. Just recently, CB Insights reached out to investors and founders to collect post-mortems on 204 failed startups. From their findings, they were able to pinpoint 20 top reasons for these failures. Guess what turned out to be number 1 on the list? There was no market need for the product. When a product is not in demand, it’s because it didn’t solve a problem enough people had. This makes it impossible to achieve growth, which is why building something people want is the necessary first step towards growth. In the same vein, a site that is not ready for conversions can also thwart the success of any strategy. This is when the site is having issues on things like signup processes, pricing, web copy, CTAs, etc. These things easily get users annoyed, make them leave the moment they get on your site and never return. For instance, Rebecca Kelley, content marketing manager for Intego, recently shared how her company was getting decent click-through rates from a PPC campaign. Their product was in demand, and we know this because people actually clicked through their ads and made attempts to convert. The only problem was that Intego’s site wasn’t ready for the conversions because of their self-described “awful” signup process. Key takeaway: In Intego’s case, they had a faulty signup process. For you, it could be something else entirely. You need to anticipate every issue that may arise from your site (or offerings) and get them settled before you decide to build and follow a strategy. You can do this by using a Funnel Report to see where people are dropping off and finding what you need to test. You can also use a Funnel Report for your onboarding. Site speed and responsive design: We’ve seen enough stats and surveys over the years proving that poor site speed annoy most visitors. Make sure your site loads quickly and works on mobile. Use Google’s speed test and mobile tools to make sure you have your bases covered. Messaging: Your copy, from homepages to other pages, matters a lot. If your messaging is not intact, people will have a hard time seeing your offerings as their solution. 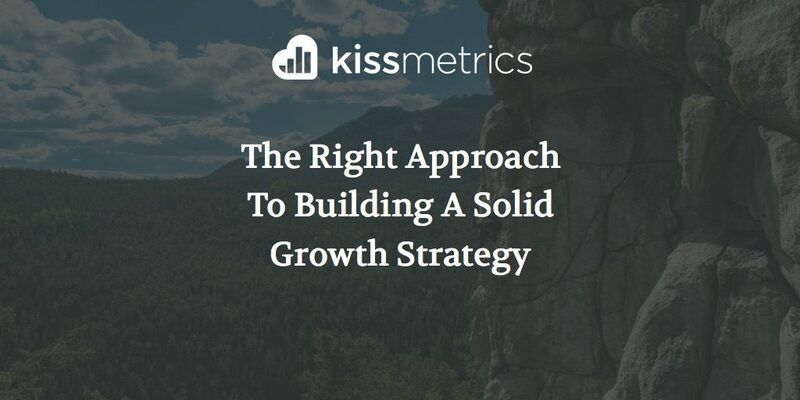 Kissmetrics has a lot of resources on copywriting. Take your pick from the hundreds of articles. Social proof: If you’re a startup, it may be difficult for some visitors to hand over their information (let alone credit card number) if they don’t see others haven’t done it first. This is why it’s so crucial to get social proof and testimonials on your site. A site without these critical elements can be getting lots of traffic with little to no conversions if there is no proof that their products really solve problems for people similar to those visiting the site. Design: Good design with clean copy shows to visitors that you care about your craft and likely have a solid product waiting for them after they signup. Focus on getting your design right before launching. If you’re looking for a simple way to get started, check out Launchrock. Quality templates are always a safe bet if you (or anyone on your team) are not design-inclined. The issues you cannot anticipate: This is the tricky part. There are some things you cannot foresee becoming an issue. This is why it’s important to have a feedback loop in place so you can gather this information and then react quickly to solve any issues that arise. Bottom line: No matter how solid a strategy is, it will eventually flop if it’s selling a product that nobody wants, or if the marketing site doesn’t convert. Once you get your product right and your site ready for conversions, next thing to do is target small wins. After all, virtually no one hits it big at once. And by now, most marketers know this already. Every high growth company you see created a strategy that had a high likelihood for success and followed it till they hit their breakthroughs. This strategy is usually filled up with subsets of tactics that bring in results gradually, little by little. And then in the long run, those small pieces of results come together to become a big bang. To those not watching the company day-to-day, it may seem like they were an “overnight success”. But few of those companies that truly achieve the “overnight success” tend to fade quickly. In contrast, the companies that seem like overnight successes actually had small, incremental wins that led them to their success. They achieved their first major customer, got on the front page of inbound.org, were featured in the press, etc. Every successful company had their small wins that contributed in making them what they are today. Buffer, for example, is one of these companies. They had their strategy, which was to write guest posts and get users from the blogs they write for. Now they’ve reached a stage today where they’re used by thousands of users and companies. But a whole lot of those guest posts were the small wins that led them to where they are today. Leo Widrich (Buffer’s co-founder) says he had to write about 150 guest posts within the space of 9 months before they got their first 100,000 customers. Each of those 150 guest post were small wins that led to their big win — 100,000 users. That’s how high-growth companies grow. They accumulate a good number of small wins and end up with a bang. They go from 500 users to 1000, 3000, 6000 and so forth. Another example that comes to mind here is Groove. Back in 2013, Groove rolled out a series to share their journey to $100k in monthly revenue with their blog readers. Their plan was to get lots of subscribers via this series and ultimately grow as a business. The strategy worked. Today, Groove has thousands of paying customers and is now close to $500k in monthly revenue. But here’s the thing (again), they understood they wouldn’t get to where they desired at once. They built relationships with more than 80 influencers– even before launching the series. Got a spot on the front page on Hacker News. Started to get their stories featured on well-known publications. Small wins. Accumulate them well enough and you’ll have an aggregate big win in the long run. The more you achieve small wins, the more motivated you get to do more — because it just means you’re heading in the right direction. What Happens When Your Strategy Goes South? Your strategy, no-matter how solid it looks, can fail. Experienced marketers know this already. It’s a bitter truth. But it is what it is: the truth. And I had to learn this the hard way. A few years ago when I started out as a freelance writer, I had a “brilliant strategy” for my freelance business. I saw what other experienced writers were doing but for some reason decided to do something entirely different, thinking I’d get a better result than other writers. My “brilliant strategy” was to launch a blog about startups. I thought I’d use that to attract founders. And when founders came to my blog and read my content, they can consider hiring me as their writer. After all, startups usually need a lot of content. Long story short, the plan failed. Why? Most startup founders don’t oversee the writers that their companies hire. That’s the job of their content/marketing managers. Those are the people my content should target, not founders! So I was writing content for the wrong set of people. My “brilliant strategy” was a big mistake that wasted a lot of my time and resources. But guess what? I learned…and grew. It’s pretty much the same case for you. That’s what you should do if your strategy goes south: Learn…and grow. That’s the one secret that virtually every high growth company you see have in common. They get a solid growth strategy, and follow it to success. But again, before the strategy, ensure your offering is in sync with the market. Once that is done, everything else becomes relatively easier. Lastly, if your strategy goes south, simply re-strategize and get a new solid plan. About the Author: Victor Ijidola is a freelance business writer (for hire) who’s been featured on sites like Inc.com, The Next Web, MarketingProfs, etc. He’s also runs Premium Content Shop.